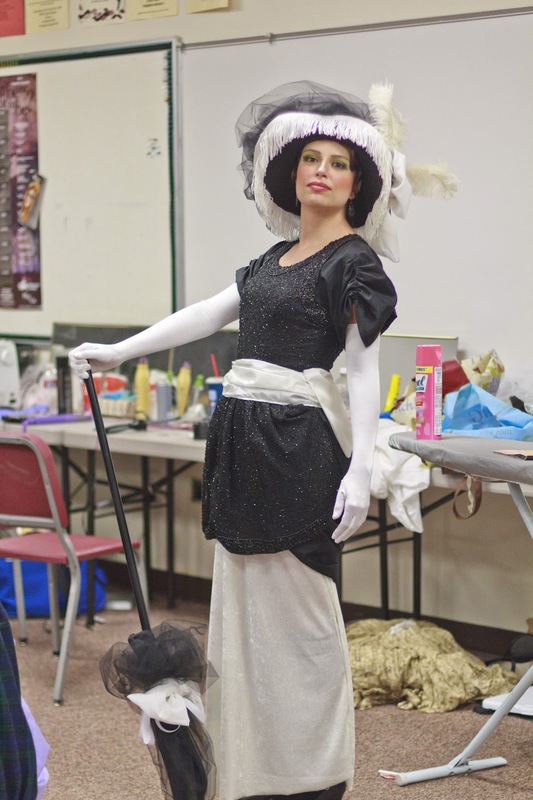 I spent it at rehearsals for Spanish Fork Community Theater's production of My Fair Lady. And then I performed in 8 shows of My Fair Lady. My part wasn't anything too big: a member of the ensemble, but David was cast as Colonel Pickering. 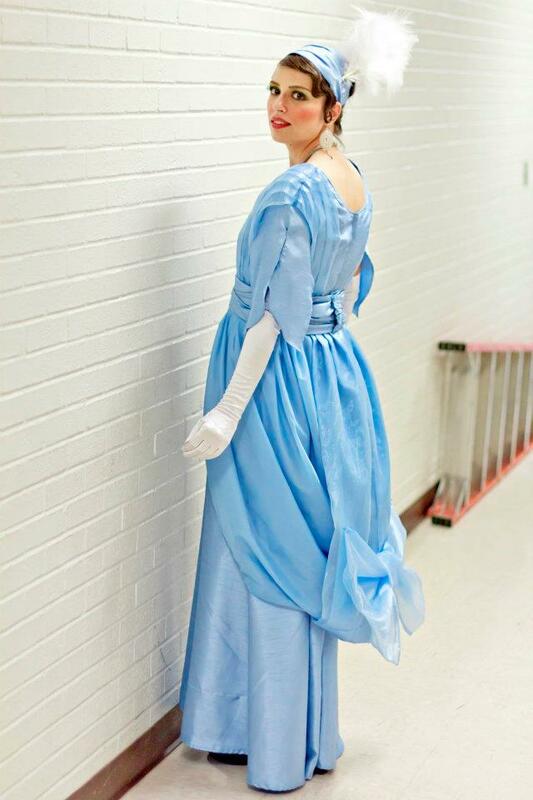 One of the funnest things about being in the ensemble was that I had nearly as many costume changes as anyone else. Five. 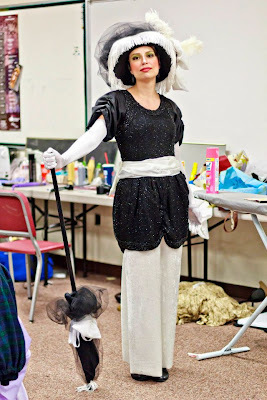 While the theater provided three, it ended up that I offered to make two of mine: my dress for Ascot (possibly one of the most famous scenes for costumes ever) and my Embassy Waltz dress. For both of them, I didn't use a pattern. Edwardian style is stunning. 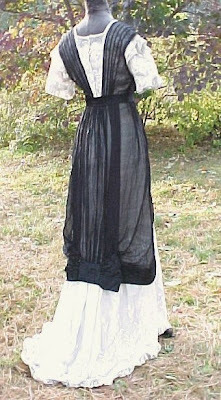 My Ascot dress I made from a beaded "little black dress," a sleeveless thing I picked up from a thrift store. I should have taken a before picture, but it was a basic black sheath dress. I cut off the bottom entirely, and gathered it around the front half of the top, then draped the black "bustle" from some taffeta to fill in the back. 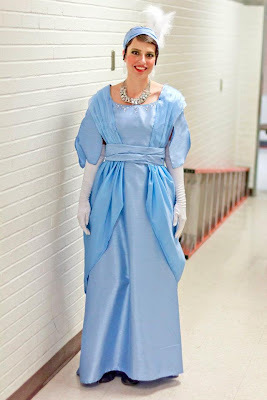 Then I added a white skirt and some sleeves, and a sash and a huge white bow. It's not terribly period accurate (the sleeves are horribly wrong), but it's not all that far off either. 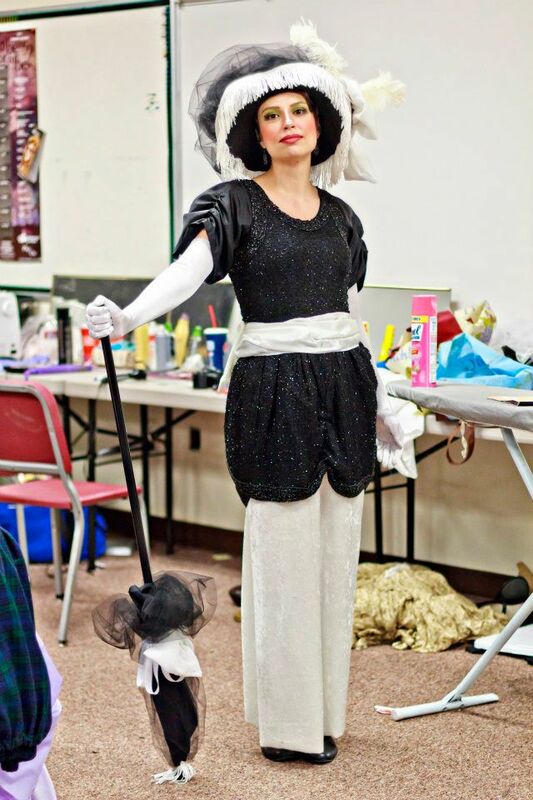 The bustle draping is very period (My Fair Lady takes place in 1912), except that mine insisted on being too fluffy! You can't see it too well in these photos--I neglected to take a good photo of the back. But, you can kinda see it from the side, and I will link you to the Facebook albums with amazing photographs of the whole show. And oh yes, I did make that fabulous hat! My waltz dress I actually based off of a period tea dress. It ended up being a little too fluffy too. And very, very blue. Again, the sleeves are horribly not period. If I had had more time, I would have done them over, but I barely finished in time as it was. I didn't even have all my accessories done until opening night (my fault). You can see how the dress of the period is very sleek and mine is a bit more poofy, but again, I didn't have a lot of time to fix it. This summer I was constantly going from one thing to the next. My sister was in town from Missouri for almost a month, so when I wasn't at the play, I wanted to be with her, and NOT sewing. Well, I wanted to sew, for I love to sew, but I didn't want to not be with her. Gorgeous! You did a lovely job. Sewing for something historical is so much fun, isn't it? And while the sleeves may not be period-perfect, they do teh job. Hmmm...was that Mary Poppins I saw in the FB pics?